Ladakh is a revelation -- with its stark landscape, epic monastries and stupas and fluttering multi-coloured flags, it offers a photographic opportunity that is truly unique. Ladakh is unusual as it offers a desert like setting high up in the beautiful Himalayas. Originally a stop for trading caravans, the area is known as 'Little Tibet' for it stunning Buddhist sites and jaw-dropping trekking paths, valleys and lakes. From the powder blue skies to pale brown roads, the culture, its gentle people and unusual flora and fauna, Ladakh offers sights and sounds that will take your breath away and keep you clicking for more! 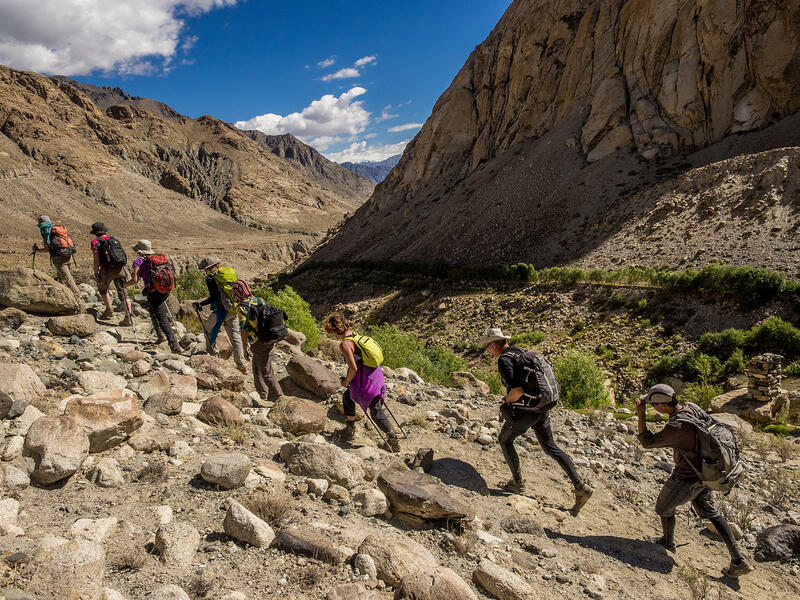 -- Spend a week in a magical place called Ladakh! Early morning fly to Leh, the flight itself is spectacular, flying over the crest of the Himalayas, we will try to get you a window seat and make sure you have your camera ready, as the view of Leh as you come in to land is incredible! Situated in the far north of the sub-continent, over 3,500 metres (11,500 feet) up on the high plateau, Ladakh (often referred to as ‘little Tibet’) is geographically, anthropologically and culturally part of Tibet. Its remoteness and sheer inaccessibility, however, have meant that it was to have a very different history to the rest of the high plateau. Having been a part of British India, it was subsequently absorbed into independent India in 1947. Ladakh’s geography protected it from the ravages of the Chinese cultural revolution that have sadly changed the rest of Tibet beyond recognition and today it contains one of the most intact Tantric Buddhist societies left on earth. On arrival in Leh you will be met and transferred to your hotel - spend the remainder of the day at leisure. Minimal exertion is recommended to enable acclimatisation to the rarefied oxygen levels in this high altitude region. After that you will be guided to visit the other parts of the monastery followed with a breakfast at the Thiksey monastery restaurant. After breakfast, you will be driven two kilometres ahead of Thiksey monastery for a photo halt along the banks of River Indus and then you will drive to visit Hemis monastery another 30 kilometres southwest of Thiksey; Hemis is the largest and the wealthiest monastery in Ladakh. Hemis festival is considered amongst the biggest and most famous of the monastic festivals, and is dedicated to Padmasambhava. Every 12 years, the gompa's means a (monastery) greatest treasures, a huge Thangka, is ritually exhibited. After that, we will return to visit Shey monastery, Shey was the summer capital of Ladakh in the past. Later in the afternoon, we will visit the Ladakh local market. Followed by a drive to the Shanti Stupa to catch the sunset view. Grab an early breakfast and set off on what promises to be a super adventurous day. You'll be visiting the stunning Nubra Valley. A few hours north of the Leh, visiting Nubra involves crossing the Khardung La pass, the highest motorable pass in the world at 18,390 feet. This will be your first stop. Spend some time stretching your legs, posing in front of the board that proclaims that fact and buying souvenirs from the gift shop. We will stop along the way to capture this beautiful landscape. Head to your hotel sight, check-in, relax over lunch and tea and get ready for a safari like you've never experiened before! That's right, the famous Bactrian Camel safari. These double humped camels are very rare and the Nubra valley is the only place in India where you can find them. Grab tight as the camel and its handler show you the beautiful landscape dotted with small valleys blooming with summer flowers. We will start the day with driving down till the Turtuk village – the last village on the border of India and Pakistan. We will spend the time in and around the village and later drive back to Nubra stopping along the way for more landscape images. Later we will explore the villages of Hunder and Diskit, walk around their streets and spend the evening at the Diskit Monastery. We will start our day exploring around our hotel followed by breakfast and driving to Leh. The evening is free to explore the town on your own. Arm yourselves with cameras as we head to Pangong Tso, the prettiest and largest lake in the Indian Himalayas. Today we will be driving through Changla Pass the third highest pass in the world! During our drive you will witness the changing landscape; we will try and capture it all! At Pangong, check in to your luxury camps, unwind and take in the beauty of your surroundings. Take a walk around the perimeter of the lake and watch as the colour of the water shifts constantly. Throw a pebble across and see how far it skims! We will spend the time photographing this amazing, beautiful and probably the most photographed lake! An early morning shoot at the lake before we start our drive back to Leh. On the way, stop at Changla again for a cup of steaming local tea and take photos. Rest of the day in Leh is on your own. Perhaps some last minute shopping and souvenir buying for people back home? im from Hyderbad.Can you please send me the complete details..